In Storyboard Pro, you can organize panels in scenes and acts. By default, acts are not available because they are not relevant to every script. If you have a story divided into acts, select this option to display and manipulate these sections—seeAbout the Storyboard Structure. When you move scenes around, the Rename Scene dialog box opens prompting you to rename the scenes. This option is enabled by default. When you deselect this option, existing scenes keep their original name and new scenes are automatically named without the Rename Scene dialog box opening—seeAbout the Storyboard Structure. Warn when Deleting Audio Tracks Display a confirmation prompt when attempting to delete an audio track. By default, when adding a transition, the length of scenes is not adjusted. Since the transition causes the next scene to start playing before the current scene finishes playing, this results in the project becoming shorter by the length of the transition. With this option enabled, when a transition is added, both scenes that are joined by the transition are extended by half the length of the transition, resulting in the project remaining in the same length, and all subsequent scenes starting at the same time as before. By default, new storyboard projects are created without sequences. 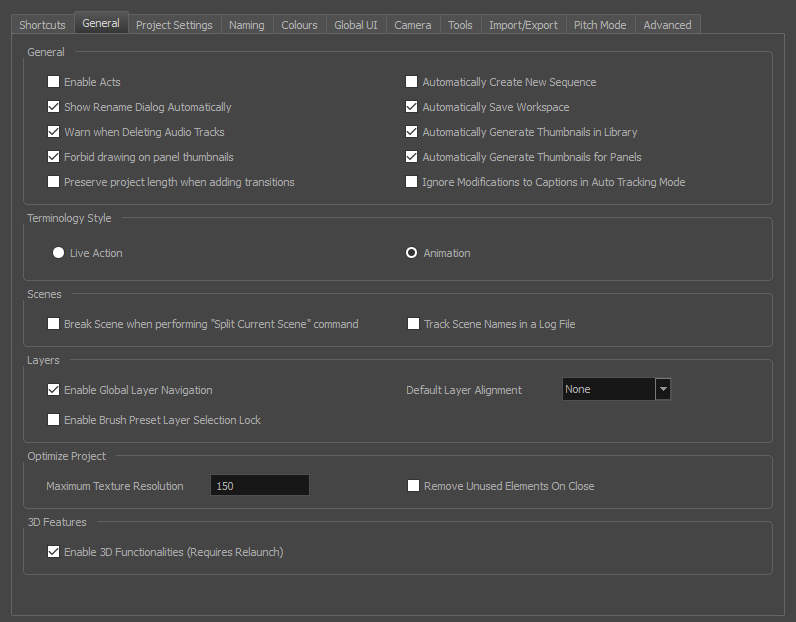 Select this option so new projects are automatically created with a sequence—seeAbout the Storyboard Structure. When any change is made to the workspace, such as adding, moving or removing a view or a toolbar, the change is automatically saved to the current workspace. NOTE If you disable this option, you can save your workspace manually by selecting Windows > Workspace > Save Workspace from the top menu. Ignore Modifications to Captions in Auto Tracking Mode When Auto Tracking Mode is enabled, any change made to a panel will activate tracking changes for that panel. With this option enabled, changes can be made to a panel's captions without automatically enabling tracking changes for that panel. Any other changes made to the panel or its content will still cause the panel to be tracked for changes. By default this option is disabled, this means that when using the Storyboard > Split Current Scene command, the current scene will be split in two before the selected panel. When enabled, the scene will be broken in three, isolating the selected panel in the middle. If you select multiple panels and use the Split Current Scene command, each selected panel will break into a separate scene—seeAbout the Storyboard Structure. Tracks scene/shot names in a log file.